Assemble at Mumbai airport to board your flight for Sao Paulo via Johannesburg. On arrival in Johannesburg you shall proceed to board your onward flight for Sao Paulo. On arrival in Sao Paulo – the biggest city of South American Continent after clearing customs & immigrations formalities we proceed to check in. Spend overnight in the hotel in Sao Paulo. Enjoy dinner at the hotel. After having morning breakfast we shall proceed for a short orientation city tour of Sao Paulo and later we proceed to airport to board flight for Rio De Janeiro. On arrival in Rio de Janeiro we shall proceed to check in our hotel for check in. We spend rest of the day free at leisure & spend overnight in the hotel. 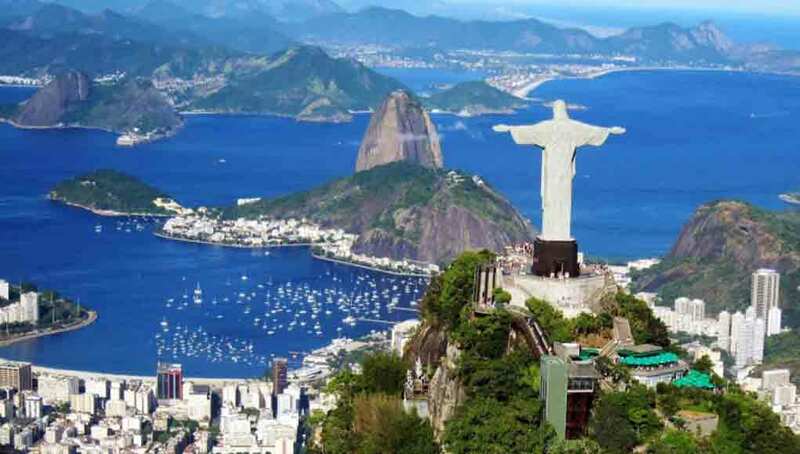 After morning breakfast highlight is a visit to the Corcovado Mountain, we pass thru the Tijuca Rainforest and later by cog train which takes 20 minutes, upon which stands the famous Christ the Redeemer statue. En route we see Rodrigo de Freitas Lagoon and the traditional Cosme Velno. Also visit the Metropolitan Cathedral, Copacabana Beach. Later Dinner at the hotel. Later enjoy the Platforma Samba Show. After morning breakfast the hotel It’s the time to enjoy this stunning panorama before we descend. We take you to visit the Main Arena (Outside View Only) where FIFA 2014 is going to be held. Later we shall proceed to enjoy the cable car ride which will give a spectacular view of the Sugar Loaf Mountain. Half of the day is free at leisure. Enjoy dinner & spend overnight in the hotel. After having early morning breakfast at the hotel we shall proceed to airport to board flight for Iguassu Falls. On arrival we directly proceed to the Foz de Iguassu National Park where we experience the amazing falls from the Brazilian side. You will experience about 240 falls spectacular view from this side. Walk through the Devil’s Throat where you experience a Panoramic 360° of the falls. If you wish there is an opportunity to take an optional helicopter trip over these spectacular falls. Later proceed to hotel for check in. Enjoy dinner at the hotel & spend overnight at hotel. After having morning breakfast we proceed to enjoy the Iguassu Falls National Park Excursion from Argentine side of the falls. From here we make our way to the Iguassu National Park to enjoy a guided walking tour of this natural wonderland. Later we return back to the hotel. Enjoy dinner at the hotel & spend overnight in Hotel. After having morning American breakfast, proceed to the airport to board your flight to El Calafate via Buenos Aires. On arrival in meet local guide and transfer to Hotel. Check & overnight in at Hotel. After early morning breakfast we proceed to Buenos Aires airport to board our flight departing for Ushuaia. On arrival in Ushuaia we proceed for city tour of Ushuaia. Here we visit the Old Jail & Tierra Del Fuego National Park. Later proceed to check in our hotel & spend the balance day at leisure. Later enjoy the dinner at the hotel. Post breakfast at the hotel we shall proceed to enjoy the Beagle Channel cruise. Enjoy the views on the cruise & return back to the hotel in the afternoon. Spend remainder of the day at leisure & overnight in the hotel. After breakfast day is free till departure time. Later we proceed to airport to board flight for Buenos Aires. On arrival in Buenos Aires transfer & check in our hotel. Enjoy Dinner and overnight at the hotel. After having morning breakfast proceed to Half day city tour of Buenos Aries which includes Avenida de Mayo that runs into the Plaza De Mayo, which is surrounded by the Casa Rosada (Government House), Recoleta Area, the Metropolitan Cathedral and the Cabildo (first City Hall, built during Spanish rule). At the other end of Avenida de Mayo you find the Congress building. Then we continue to Evita Graves, San Telmo, the best kept historical neighbourhood and eldest district of Buenos Aires. Here we have time to stroll around Plaza Dorrego, where you can find many antique shops. Enjoy dinner & overnight in the hotel. After Breakfast at hotel day is free at leisure to explore the city on own. The are many things to do in Buenos Aires like Shopping, Wine Tasting etc which can be done on this day. Enjoy Indian Lunch & Indian Dinner. After having early morning breakfast we will proceed to airport to board our to Lima the capital city of Peru. On arrival in Lima we proceed for the City Tour of Lima which shall include The Plaza de arms with the beautiful buildings of the government places, the town hall & the cathedral & also the other remarkable places in the capital city. We also view the Palacio Presidential Palace, Arch Bishop Palace, Miraflores Waterfront etc. We proceed to check in our hotel. Evening enjoy shopping at the Larco Market. Enjoy dinner and spend overnight at hotel. After having morning breakfast we will proceed to airport to board our flight departing to Cuzco. On arrival in Cuzco we proceed for our city tour which shall include the remains of the Ruins of Cuzco, archaeological remains of the Inca times, colonial arts & treasures from the Spanish times & we shall also visit the Sun temple. Later in the evening after check in hotel, you may visit the Pisac Market for local Peruvian Handicraft Shopping. Later we will proceed to check in our Hotel & enjoy Indian dinner. After having morning breakfast we will proceed to the train station which will take you to Aguas Calientes. From this place small busses will take you to the ruins town of the Machu Picchu. This place is also called the Lost city of Incas which is the cultural heritage of its mankind with a technique incredible for its era. We will appreciate the stone on stone without any cement fitted together perfectly. Later we shall also have a guided tour of the ruins. Evening return to Cuzco & enjoy the Indian dinner & spend overnight in the hotel. After having breakfast at the hotel we proceed to airport to board flight to Lima. On arrival at Lima airport we board our connecting flight for Sao Paulo. On arrival after clearing customs and immigration we proceed to check in hotel. Rest of the day is free for leisure to explore this beautiful city. Enjoy Dinner and spend overnight at the hotel. After morning Breakfast we proceed to airport to board flight departing for Johannesburg / Abu Dhabi. Spend overnight at onboard flight. Arrive and connect flight for Mumbai. Upon arrival tour ends. Return Home with Happy Memories of the Tour!! !